We’d love your help. Let us know what’s wrong with this preview of Short Stories by Rich DiSilvio. 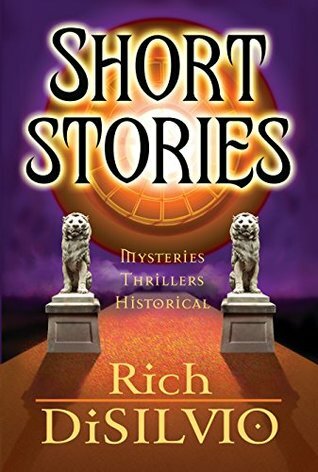 SHORT STORIES by Rich DiSilvio features a rich collection of mysteries, thrillers and historical works from award-winning author Rich DiSilvio’s past and present. Also included are three historical vignettes from his acclaimed “Tales of Titans” series. For those not acquainted with DiSilvio’s larger works this edition makes a fine introduction to the mysterious, historical SHORT STORIES by Rich DiSilvio features a rich collection of mysteries, thrillers and historical works from award-winning author Rich DiSilvio’s past and present. Also included are three historical vignettes from his acclaimed “Tales of Titans” series. To ask other readers questions about Short Stories, please sign up. Short Stories is a wonderful way to introduce yourself to the literature of Rich DiSilvio. It is the first of multiple volumes of short story collections. The format currently consists of two parts, though this could change with future volumes. The first part is a collection of original short stories, while the final part of the books are selected vignettes from the author’s previously published Tales of Titans series. This format seems an ideal way to introduce yourself to a new author. You can Short Stories is a wonderful way to introduce yourself to the literature of Rich DiSilvio. It is the first of multiple volumes of short story collections. The format currently consists of two parts, though this could change with future volumes. The first part is a collection of original short stories, while the final part of the books are selected vignettes from the author’s previously published Tales of Titans series. This format seems an ideal way to introduce yourself to a new author. You can get a sense of the author’s style through multiple, varied stories without the time investment required of a full-length novel. I actually came to these stories from the opposite direction, having previously read Mr. DiSilvio’s longer works, and I can attest to their value as an introduction to this talented author. The short stories in this first volume include a tale of murder set against the backdrop of the music industry, a World War II tale of espionage regarding weapon plans devised by Nikola Tesla, and another World War II tale about a bomber squadrons final mission. If these stories intrigue you, definitely consider some of the authors longer works, such as My Nazi Nemesis and Liszt’s Dante Symphony. New York author Rich DiSilvio, a man as committed to music, art, philosophy and sociology as informed by the fine arts, has previously takes periods of history with all of the fascinating changes, discoveries, triumphs and failures and by introducing some fictional enhancements within the stage setting of this era makes it far more credible. And in DiSilvio's handling of the parallel or concurrent unraveling of historical events with those of the textbook rigidity of his main Titans books he provided not only keen insight but also pauses for the inclusion of the arts, so often ignored by other historical writers. Yet his talents don’t pause there – his other books include MY NAZI NEMESIS, BLAZING THE GILDED AGE, LISZT’S DANTE SYMPHONY, MEET MY FAMOUS FRIENDS: INSPIRING KIDS WITH HUMOR, THE WINDS OF TIME, HATRED AND INTEGRITY, and his short story series of which this is Book 1. Of particular interest to Rich’s large audience of readers is that as a software designer/developer, Rich pioneered the first interactive CD-ROM for educating staff and parents about Applied Behavioral Analysis (ABA) for training individuals with autism. To offer an idea of how varied Rich’s select is, the titles in this collection are as follows: The Night Music Died, The Death Ray Mystery, Tito’s Tortured Mind, Kennedy: Charismatic yet Reckless Leader, Borgias: The Pernicious Pope and Devious Duke, Edison & Tesla: The Electro Age, and Ludington & Armistead: Unsung Heroes. For those not acquainted with DiSilvio’s larger works, this edition makes a fine introduction to the mysterious, historical, and thrilling mind of the author. Impressive as his credentials are there is no comparison to becoming immersed in his brilliant stories – tales that transport s into other worlds – whether in timeframe or terror. Rich is a gifted artist on many levels and his talent continues to grow. This was a nice little book. Really well written in so full of knowledge. I love a collection of stories and this was great. I normally read romance but this book was suggested to me and I am so glad I read it this is a collection of murder mystery and historical as well. You kind of got a small history lesson with this book. There are things that I didn't even know about Tesla that are in this book. I really enjoyed the historical more so than the murder mystery. But that was good too I was so w This was a nice little book. Really well written in so full of knowledge. I love a collection of stories and this was great. I normally read romance but this book was suggested to me and I am so glad I read it this is a collection of murder mystery and historical as well. You kind of got a small history lesson with this book. There are things that I didn't even know about Tesla that are in this book. I really enjoyed the historical more so than the murder mystery. But that was good too I was so worried about doing this review and letting something go I normally review each individual story but I think I'll leave that a mystery to you. First one is about a murder of a record executive and man did that one shock me. The second book is this store is called the death ray mystery about Tesla’s death ray and how the Russians may have stolen it. But man it was fun to read. Then there are small stories about Kennedy, Tesla, Edison and so many others, that gave you lots of history lessons. I really enjoyed this book and I hope you do too. A nice collection of short stories, mainly set in the historical genre, albeit each story has a little something extra, mystery, crime and even drama. Seven different stories at 142 pages long, this is not a very long book, so you can think of this as an introduction to the works and writing style of author Rich DiSilvio. The stories include a murder mystery about a Record Executive, Kennedy dealing with the paranoia of Edgar Hoover as well as a story about a young sixteen year old Sybil Ludingt A nice collection of short stories, mainly set in the historical genre, albeit each story has a little something extra, mystery, crime and even drama. Seven different stories at 142 pages long, this is not a very long book, so you can think of this as an introduction to the works and writing style of author Rich DiSilvio. The stories include a murder mystery about a Record Executive, Kennedy dealing with the paranoia of Edgar Hoover as well as a story about a young sixteen year old Sybil Ludington making the treacherous midnight ride to alert the troops that the British are coming. The change of pace between each of the stories was refreshing, it cemented the feeling as if I was reading a different book in each story even as the similar writing style did nothing to throw off my reading. The order of the stories was also well placed and the plot in each story moved well. I think that this book was pretty good, and well worth the read. It certainly gave me something to ponder about the “facts” of history. The best we can find in these compilations of short stories is the unexpected, the things you wouldn’t find in a romance story or a fantasy world and this was a pleasant surprise to read. We can appreciate the amount of effort invested here, the historical facts presented in the story are accurate and they add a sense of realism, there is a universe in this book and everything works there the same way it works here so it’s unbelievable how skillful this author can be, not only does this book poss The best we can find in these compilations of short stories is the unexpected, the things you wouldn’t find in a romance story or a fantasy world and this was a pleasant surprise to read. We can appreciate the amount of effort invested here, the historical facts presented in the story are accurate and they add a sense of realism, there is a universe in this book and everything works there the same way it works here so it’s unbelievable how skillful this author can be, not only does this book possess all that mentioned before but also the story and characters are compelling as well, the way the story goes, trust me you are going to be at the edge of your seat the entire time. To wrap this review, you are not going to find such exquisite stories with facts that not only will impress you but also will make you read the whole book in one session, the wait is over and you need to read this book. This novel by Rich DiSilvio is a collection of short stories that range in the mysteries, thrillers, and historical genres. You’ll find DiSilvio’s famous Tales of Titan writings included in this novel as well. These short stories will take you on various adventures like in mysterious forests and even in the Revolutionary War. His mysteries and thrillers are intriguing and his historical stories are captivating and will teach you a few things about history you might not have known about. These sto This novel by Rich DiSilvio is a collection of short stories that range in the mysteries, thrillers, and historical genres. You’ll find DiSilvio’s famous Tales of Titan writings included in this novel as well. These short stories will take you on various adventures like in mysterious forests and even in the Revolutionary War. His mysteries and thrillers are intriguing and his historical stories are captivating and will teach you a few things about history you might not have known about. These stories are split up into 7 different chapters which altogether is 144 pages. There are also a few pictures included in the novel which can help you to get an idea of what the story will be about. Rich DiSilvio uses his uncanny ability to craft meaningful vignettes of historical figures in his latest effort, Short Stories, and it is a delightful and entertaining read for anyone seeking a few hours of intelligent reading within a framework of history. DiSilvio uses historical facts and authentic quotes to build compelling dialogues as he weaves his stories into a beautiful tapestry of captivating stories, much to the delight of the reader. Disilvio has other published works and each one is Rich DiSilvio uses his uncanny ability to craft meaningful vignettes of historical figures in his latest effort, Short Stories, and it is a delightful and entertaining read for anyone seeking a few hours of intelligent reading within a framework of history. DiSilvio uses historical facts and authentic quotes to build compelling dialogues as he weaves his stories into a beautiful tapestry of captivating stories, much to the delight of the reader. Disilvio has other published works and each one is worthy of reading as his ability to bring the reader into his stories is a remarkable talent and worthy of high praise. If you are already a fan of his, you will love and enjoy this latest work. DiSilvio has a unique style all his own and these shorts sparkle with his talent. From a provocative NYC crime story to two thrilling WWII stories, and ending with several informative historical shorts, featuring JFK, the Borgias, Edison, Tesla and two Revolutionary War heroes this is a great starting point for those not familiar with the author or for anyone with little time to read lengthy novels or historical biographies. A fine collection that kept me entertained and intrigued over the weeke DiSilvio has a unique style all his own and these shorts sparkle with his talent. A nice and short collection of short stories focused on murder mystery and history. Its knowledgeable and fun to read at the same time. The characters seem real, historical information is clean and true, mystery is thrilling and author’s effort shows up in the book. A variation in each story helps to read with break and enjoy the context well. Rich DiSilvio is a multi-award-winning author of thrillers/mysteries, sci-fi/fantasy, historical fiction, nonfiction and childrens books. He is a scholar of history with a lifetime of interests in ancient civilizations, European & American histories, biographies, architecture, art and music. Throughout his professional life Rich has engaged several fields; having been an architectural designer Rich DiSilvio is a multi-award-winning author of thrillers/mysteries, sci-fi/fantasy, historical fiction, nonfiction and childrens books. He is a scholar of history with a lifetime of interests in ancient civilizations, European & American histories, biographies, architecture, art and music. Throughout his professional life Rich has engaged several fields; having been an architectural designer, remodeler, artist, illustrator, new media developer, educational software programmer and writer.